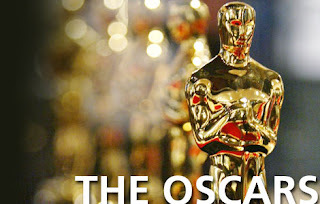 If you listened to our podcast this week, you know that we talked a little about the upcoming Academy Awards that are being held this Sunday. We're all pretty unanimous on a lot of the categories, but for fun we also decided to play 'what if we held to sole vote for the category'. So, just in case you missed it, all of our thoughts and opinions on the topic are listed below. I know this means very little, but it seemed like something fun to do before the show. After the break, see each of our choices for all of the main categories (we stuck to only those because, while we love the Oscars, we're not trying to overwhelm you with 20+ different awards by four different people. Just the fun ones for now!). If you're interested in playing along, leave your predictions and choices at the bottom as well. Or, I've created a printable ballot for your own home use. Print a few out and share them with your friends. Let's see who comes out on top come Oscar night! Also, just before we get started, there are a lot of explanations that go along with these picks, so if you want any details on why picks are the way they are, check out Ep. 3 of our CinemaCast (the second half specifically) where all is answered. So after they're announced, we'll get a post up with ALL of the awards and winners. But enjoy these for now! And as we mentioned above, we'd love to hear your thoughts on the categories too! Just in case it doesn't get changed on the actual site, I almost immediately regretted my prediction of Clooney winning the Best Actor Oscar, and I'm changing my prediction to Dujardin. Still want Clooney to win though.